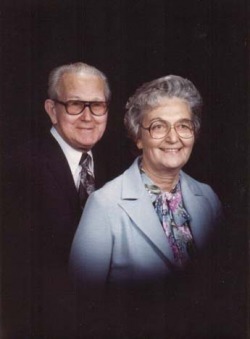 Casper Earl Mace was born on July 21, 1909 in Lewis County, Missouri, the third* child of Walter and Lily May Mace. (*Mary Louise died in infancy) Earl's childhood was scarred by tragedy. In 1916, Walter became ill and passed away on July 25th. Two years later, his mother Lily and younger sister Pansy both became ill with the flu. Lily passed away on December 17, 1918. Two days later, on December 19th, Pansy died at the age of three. The two were buried together in the same coffin. Earl and his older brother Alfred Edwin spent their remaining childhood years doing odd jobs and sleeping at times in barns of various aunts and uncles. Unsure of his exact birth date, Earl enlisted in the US Navy in January of 1927 at the age of 17 1/2. By the time the Navy acquired his birth records, Earl had turned 18. In the early 1930's, Earl met a young woman named Ruth Ophelia Wallace. The two married and had a daughter. Ophelia Ruth Mace was born in September of 1935. At last, Earl had a family. Regretfully, his happiness was short lived when he and Ruth divorced. He was granted custody of their daughter but the Navy called him back to active duty. Having no one to look after his young daughter, Earl turned to his former in-laws for help. However, once he was at sea, they handed Ophelia over to Ruth. Ruth's new husband, Wm. Gordon McCracken, filed for adoption, changed Ophelia Ruth's name to Kathleen Ruth and the three disappeared. In the years that followed, Earl's brother Edwin gave him updates about Kathleen but refused to tell him where she was for fear he, too, would be cut off from her. While on shore leave, Earl met Edythe, the owner/operator of a taxi service in Coos Bay. The two hit it off and began dating. Not too long after, they were married. Earl doted on Edythe's daughter Carol but he never forgot his own. He held out hope that one day he would find her and they would be a family again. Nearly sixteen years later, in 1956, Kathleen, now married and living in southern Oregon, found him. For the next nineteen years Earl enjoyed a relationship with his daughter. Watching her family grow to seven children, taking trips to the beach, camping, spending holidays together. But his joy wouldn't last. After a misunderstanding, Kathleen pulled away from him. Two years later, in December of 1977, Kathleen passed away. In 1983, Earl became sick with prostate cancer. Edythe did research on Indian remedies and made what she called horrible green milkshakes for him to drink. He drank them and never complained. When he returned to the doctor for a check up, they found no trace of the cancer. However, his aorta failed and on December 9th he passed away.